Even though the regulations for Expeditions to the Inka trail, point that the bookings must be done 5 days before the date of start, it's recommendable to do it beforehand, the average in high season points that 90 days befote the Start there is not space, due that only 500 people can enter per day, in order to protect both, the Inka trail and the santuary of Machu Picchu. Cuzco: Inca Trail Start Meet at the office at 05:45 hrs to board the bus. Ensure you have your original passport and ISIC student card (if applicable). The journey to trailhead at km 82 takes approximately 3 hours. We will enjoy breakfast along the way. Walking times are always approximate depending on weather conditions, group ability and many other factors, but you will walk about 2-3 hours before lunch. After lunch, we walk on just past the village of Wayllabamba to our first camp (3000 mtrs). This first day has us walking through the valley. It starts at 2380 mtrs with a small climb to a platform overlooking the Incan site Llactapata and rewards you with superb views of Mount Veronica. Inca Trail Day 2 is the most difficult day as you walk from about 3000 mtrs to 4200 mtrsâ€"the highest pass of this trek (Dead Woman Pass). You can walk at your own pace, stop to get your breath whenever you like. You will find your energy returns once you continue down to the valley of Pacaymayo. Campsite at 3600 mtrs. You can hire a porter from the village of Wayllabamba to carry your pack to the top of the pass for approximately US$120.00. You must organize and pay this money directly to the person who carries your items. Please check your belongings upon receiving them at the end of this service. Inca Trail Day 3 is exceptionally beautiful because of the ruins and incredible paved trail (and more importantly for your lungs, there is a lot more down than up!!!). There are about 2000 stairs descending from Phuyupatamarca to Wiñaywayna, so take care with your knees). If you have had knee or ankle injuries an extra porter is recommended so that you are not carrying extra weight and overstressing your joints. Guided tours of all the ruins. Camping is usually at Wiñaywayna (2700 mtrs). Get up extremely early to arrive at Intipunku, "The Gate of the Sun," and view the first sun illuminating majestic Machu Picchu. It is still a 20 min walk down from here to the famous view from the terraces at the end of the trail. Take your photos now before the 10:30hrs crowds arrive. Your tour of Machu Picchu should finish between 10:30 hrs and 11:00 hrs and you have free time to climb Huayna Picchu (it will take at least 90 minutes). A maximum of 400 hikers can climb this mountain per day, so start immediately after your tour! 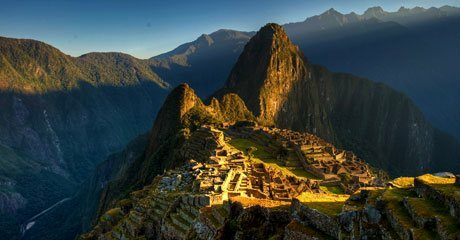 Or just collapse under a tree and quietly reflect in amazement at the mystery, the architectural achievement and beauty of Machu Picchu. In the Afternoon return to Ollantaytambo on train, at the train station is going to wait for us the bus for come back to Cusco. All the buses the coming back from the Inca Trail leave the passengers one block from the main square, you are going to return to the hotel by yourself. Bus transportation to the Start of the trek. Food for all the trekking. 03 breakfasts, 03 lunches, 03 suppers (snacks). Kitchen Carps , Dinning and Bathroom. Entrance ticket to the citadel of Machupiccu. Return train ticket to Ollantaytambo. We recommend bring light clothes for the sunny days and warm clothes for the nights, at night the temperature can reach 0Âº C, in some places (32Âº F). Depending on your interest you can bring a recorder camera or a photographic camera, compass, sunglasses.